Born in Lahore (then in British India and now in Pakistan), Dhanraj Bhagat is one of many accomplished sculptors worldwide who turned to wood, stone, and earthen materials in the 1940s and 1950s. Moving away from the British colonial legacy of academic naturalism, Bhagat was among a number of Indian artists, in particular, who turned to a combination of abstraction and figuration to articulate new ideas. Symbols speaks to his larger practice of pitting the artistic language of figuration against the wood’s simplicity. He foregrounded its materiality, coating it with minimal paint varnish and leaving its surfaces visible. A vertical stack of cubic and spherical shapes culminates in a yawning, face-like ovoid that hints at figuration, yet its totemic abstraction precludes any narrative reading. 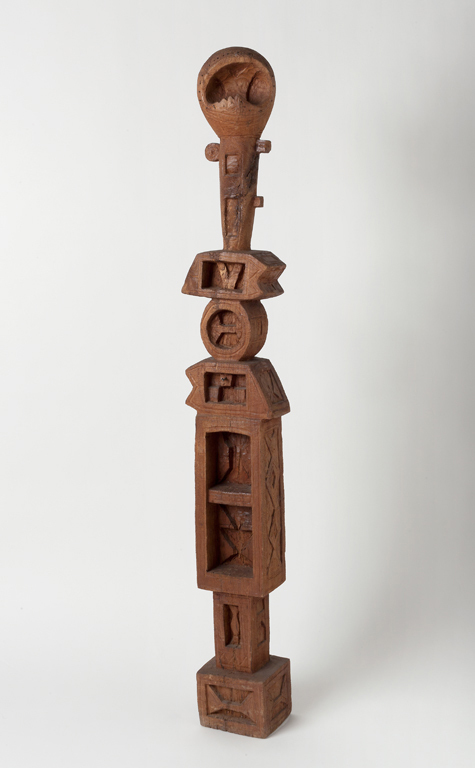 Bhagat participated in India’s first three Triennales (1968, 1971, and 1975) as well as the All India Sculpture Exhibition (1947 and 1949) at the National Gallery of Modern Art, New Delhi. He also exhibited with the All India Fine Arts and Crafts Society, New Delhi, one of the first organizations to mount exhibitions of modernist art in India. This state-funded, largely conservative space discouraged experimentation in art, however, alienating some of its members and associates. In the late 1940s several of the group’s disenchanted members, along with other artists, formed the deeply influential artists’ collective Delhi Silpi Chakra. Bhagat was among the artists to exhibit in the Silpi Chakra’s first show, in 1949. In 1977 he received the Padma Shri, one of the Indian government’s highest civilian honors. Dimensions 48 x 7 3/4 x 4 3/4 in.